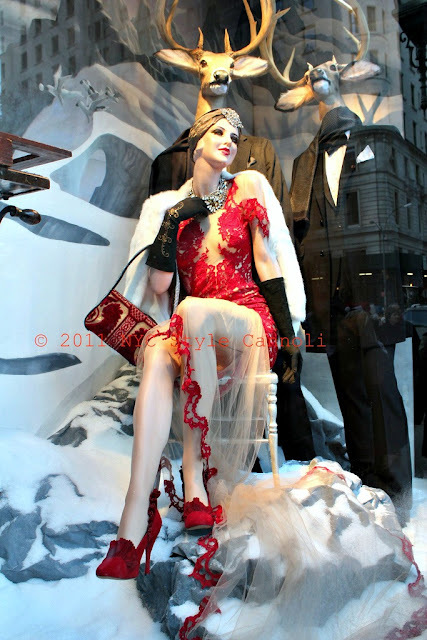 Photo Gallery Tuesday " Bergdorf Goodman 2011 Holiday Window"
I cannot believe the holidays are almost here! I don't know about you, but I think the last few months have just flown on by. This is one of the fabulous holiday windows from the classic Bergdorf Goodman store on 5th Avenue. I just loved everything about this look. The elegant handbag, the gorgeous shoes (I wouldn't be able to walk in them BUT fabulous), the hat, the jewelry....oh I just love the whole look! How great would it be wearing this outfit, in NYC, with a little snow dropping? Just classic. Ready or not for the holidays, they are well on their way! Be sure to make your Tuesday the best it can be!! Yes I know that but I am in love with Bergdorf Windows. Plus I don't think I have any turkey window shots but maybe will get this weekend. If anything, I would kill for that handbag! !